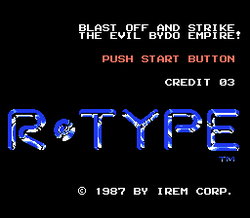 R-Type is a game that set the standards for side scrolling shooters. It had a unique force weapon that could attach and detach from your ship, serve as a second blaster on the screen, and could also be used as a shield to protect your ship from oncoming attacks. 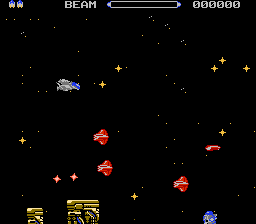 It also had intense alien boss battles where your ship would take on an enemies the size of the screen. This awesome game had ports made for several different consoles, but somehow never made its way over to the NES. What we got instead is a Japanese clone called Magic Dragon. 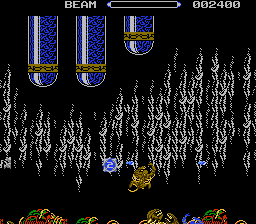 Although Magic Dragon is a blatant ripoff of R-Type, the graphics were horrible in comparison. The ship was an ugly yellow, and the enemies were nothing more than genetic robots. This hack changes all of that, and turns Magic Dragon into the game it was trying to copy, R-Type. The R-9 ship was added back in place of the awful yellow one. 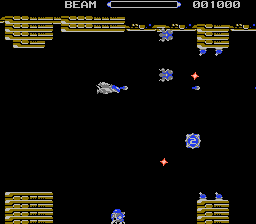 All graphics, enemies, and bosses were changed as well.